Every weekend, a wave of young people surges through Spitalfields and down Brick Lane, bringing riotous new life to these old streets. Some come to show off their outfits, some come to sell off their stuff, all come to participate in the crowded drama of the markets, shops, bars, clubs and galleries in which all kinds of cultural interchange and discovery are possible. At the hub of this whirling hurricane of excited humanity is Rough Trade East in the Truman Brewery, a cavernous independent record shop that opened up audaciously a few years ago with triumphantly perverse logic just at the time all the music chain stores in London were shutting. There are no fancy shop fittings in this whitewashed warehouse space but there are bicycle racks and there is a coffee shop. Crucially, the vinyl is at the front of the store and you can spend all day in here listening if you please. 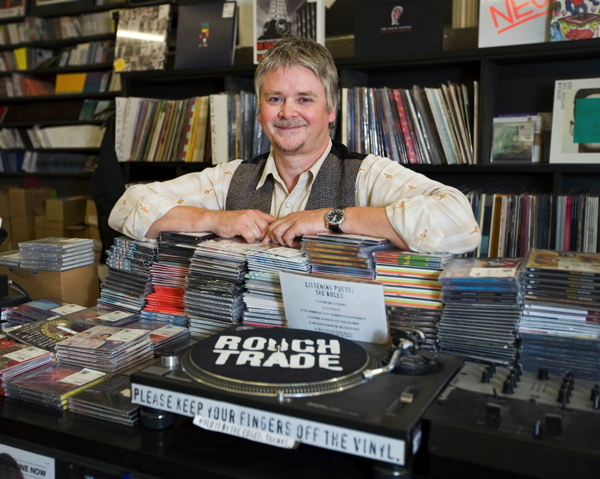 When he dropped out of the London School of Economics at the age of nineteen to work in the local record shop in Aylesbury instead, Pete had no idea where it would lead. As he confided to me, “It was no more than a booth really, like a kiosk at a railway station. Two racks of records, an alleyway, two windows and an L-shaped bit where the live records were stored. A one man operation. No loo. You locked up for five minutes if you got caught short.” Earth Records was a sideline for the owner Dave Stopps who needed a ticket outlet for the ambitious concerts he was presenting at Aylesbury Friars, bringing in Sham 69, David Bowie, Roxy Music and Lou Reed, and not unsurprisingly, Pete got a taste for the excitement of it all. 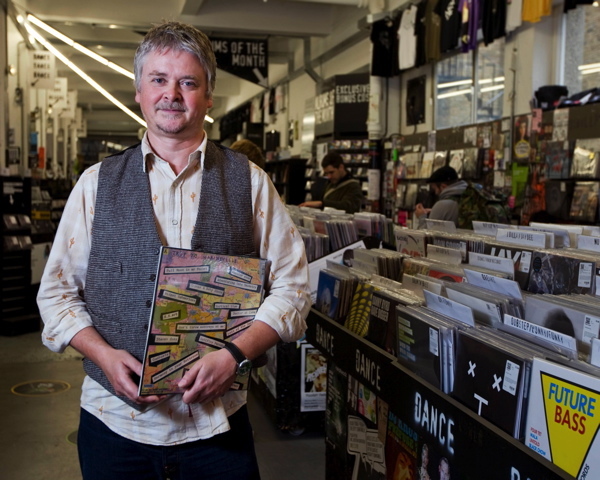 “Rough Trade used to send the records down to us every Friday night. It was such a thrill going down to the station and waiting for the box and immediately opening it up and going through the records. They were invariably brilliant. Then the next day a little coterie of in-the-know-punks would come in and buy them up.” he recalled. Pete was offered a job by Rough Trade driving their Reggae van around London selling pre-release LPs, but at nineteen years old he found it too challenging. 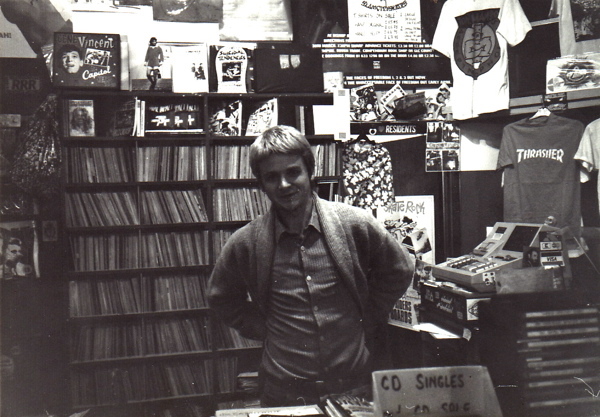 Then, in May of 1979, they invited him to work in their shop in Portobello, famous as a meeting place for musicians, journalists and everyone involved in the music industry, where he was to spend the next twenty years, “It became a nightmare on Saturdays, full of glue-sniffers and punks, happily that side doesn’t exist any more.” recalled Pete affectionately. Set up originally as a hippy-influenced workers’ collective, Rough Trade became identified with the punk explosion. By the nineteen eighties, that had passed and the company hit problems, laying people off. Then one day in 1982 – “the year of the great change,” Pete calls it – he came to work as usual only to learn that the shop was going to shut. Pete talked with the others who worked in the shop, and a new phase began.“We decided to ask to take the shop over, and it was agreed in minutes” said Pete, uncertain to this day if it was a set-up and this was his expected response, “With a shake of a hand the record company and the shop parted company. There has been no contract to this day.” confirmed Pete. “We ploughed the indie furrow until 2006,” he continued, “until it became difficult to sustain an existence because the model was no longer functional. It’s a tough business and we were on the wrong side of the Mr Micawber equation.” The shop in Covent Garden was shut and Slam City Skates, a subsidiary, was sold. This was the moment when Pete remembered Earth Records and that little coterie of in-the-know-punks in Aylesbury. And Rough Trade East was launched in Spitalfields, in the faith that there are people who love music and there has to be more to it than chart hits in the supermarket.“We brokered deals to get things for favours,” confided Pete, recognising it was make or break for the company,“and we managed to get it open in three months, at a fraction of the budget anyone envisaged possible. Now it has taken on its own life, a focal point for visceral and edgy creativity, not prescriptive or pompous.” And, unwittingly, Rough Trade has become the most recent inheritor of the long tradition of those that have come to Spitalfields to reinvent themselves. In an era of dumbing-down there is something heartening in the rare and paradoxical success of a music store that has unapologetically brained-up. Speaking with Pete, I learnt that the egalitarian quality I like so much in Rough Trade, creating a cultural space where everyone meets as equals, has its roots in the inspiration that fired him thirty years ago, encountering the world of hippies and punks. This is a space of possibility where anything can happen. You might even stumble upon an unexpected Radiohead concert here. No wonder it is a place of pilgrimage. Pete is no longer the nineteen-year-old gangly kid he was when he started out working in Earth Records in Aylesbury, although he still lives in Aylesbury and now commutes to Spitalfields every day. Once he turned down the job to drive the Reggae van, yet today he drives back and forth between Rough Trade East and the shop in Portobello, making deliveries. “My involvement in this turned what was a fleeting interest into a lifelong obsession,” he declared to me in wonderment, yet without regret. 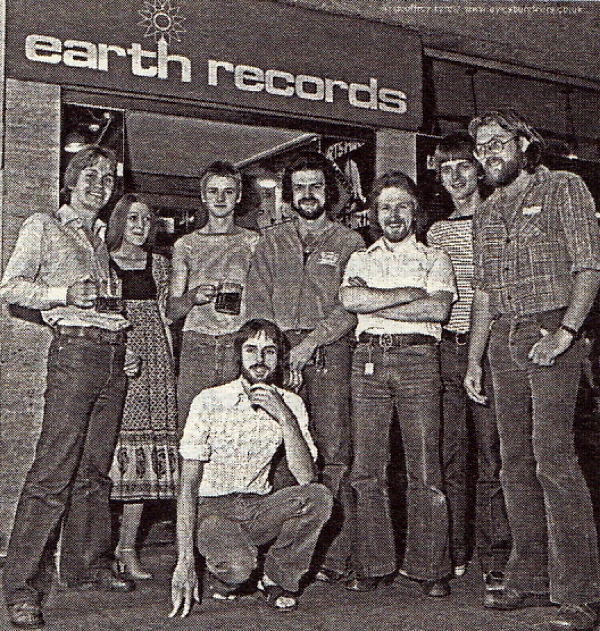 Pete Donne (standing third from left) at Earth Records, Aylesbury 1979. 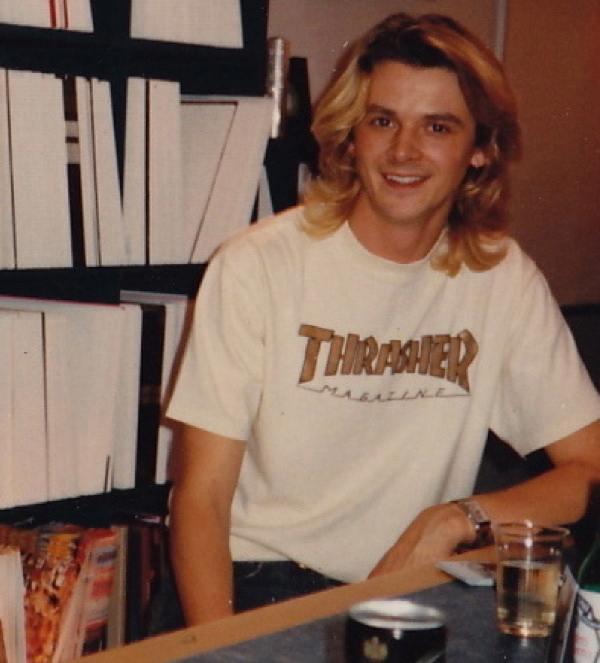 Pete in the nineties at Rough Trade, Portobello. I am delighted to be joining forces with Rough Trade to present a series of Chit-Chats in which characters from the pages of Spitalfields Life interview each other live in front of an audience – after hours in the record shop in Dray Walk, Old Truman Brewery, Brick Lane. 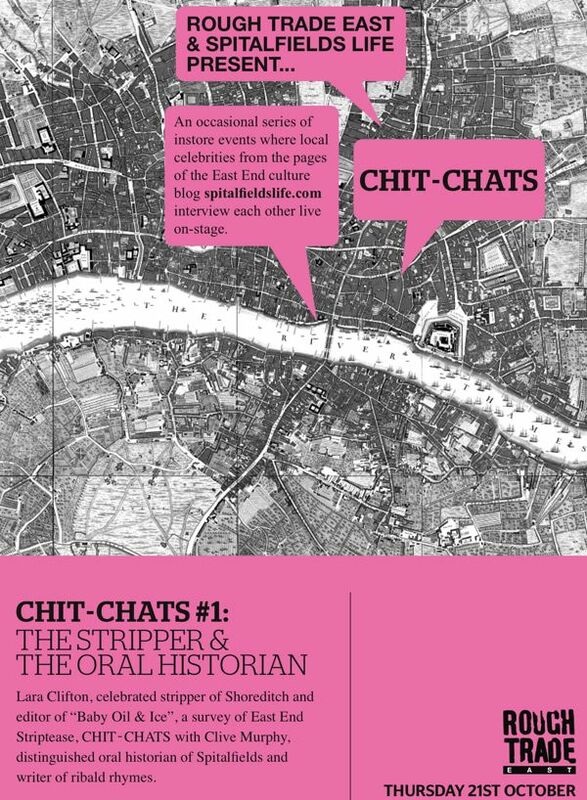 This occasional series commences next Thursday 21st October at 7pm with CHIT-CHAT #1 The Stripper & The Oral Historian, featuring my esteemed friends Lara Clifton, the celebrated stripper of Shoreditch, in conversation with Clive Murphy, the oral historian of Spitalfields and writer of ribald rhymes. Admission is free and no booking is required. Do please come along to help me launch this auspicious new venture, I hope it will be amusing and informative, and we can all go along to the Golden Heart for a couple of drinks with Sandra afterwards. I do believe you have the makings of an excellent podcast with chit-chats for those of us who live many hours away but still delight in the comings and goings. i remember you well at earth records. at the time i was a young punk. and also used to chat if i went down to portabello road rough trade. the new shop past the fly over. used to hang around the old rough trade, apart from earth records. just wanted to say hello. i still go to punk gigs. some things never change.